Cape Town, winelands, whale-spotting & Botswana camping safari. It’s your honeymoon. But you don’t want a traditional lazy beach honeymoon. In fact, you want a bit of everything: You like cities but you love to explore the surrounding countryside. You love camping, but you want some luxury in there too. You like eating out in good restaurants and wine tasting. You want to go on game drives spotting wildlife. You want to see some natural wonders too. This was the brief I had from one recent customer and here’s what we came up with together. This trip combines a small group tour and a tailormade self-drive to give a fantastic alternative honeymoon exploring Southern Africa. Primi Royal is a lovely small guesthouse with 10 individual guest rooms in the beautiful Camps Bay area of Cape Town. Camps Bay has a lovely white sand beach and many bars & restaurants, yet it’s just a bus ride away from the centre of Cape Town. Collect your car from the centre of Cape Town and head out to the beautiful winelands of the Western Cape. It’s well worth taking the long route around the coast and stopping at the Cape of Good Hope at the end of Cape Peninsula. This was said to be the Southernmost point of the African continent and the point where the Atlantic Ocean meets the Indian Ocean. It’s now said that this is inaccurate but who cares for minor details – it’s a beautiful spot! Enjoy wine tasting at Spier or take a tour around the various wineries in Stellenbosch. Scoot around the Kogelberg Nature Reserve en-route to Hermanus. It’s possible to add on activities such as walking, mountain biking or White Water Rafting here. There is also a Penguin Colony at Stony Point (near Betty’s Bay) which is well worth a stop. Hermanus is a beautiful small coastal town famous for spotting the Southern Right Whale. The season for spotting whales is generally from June to December. The Whale Coast Hotel offers luxurious apartments perfectly located in the centre of the town. Today drive back to Cape Town and drop your hire car at the airport before boarding your flight to Windhoek in Namibia. On arrival you will be met by a representative from your small group adventure tour company and transferred to Windhoek Urban Camp for the start of your 9 day camping adventure from Windhoek to Livingstone in Zambia, crossing from Namibia to Botswana to Victoria Falls on the Zambia side. Windhoek Urban Camp is a centrally located comfortable camping ground situated in the heart of Windhoek. It is the perfect get away with all the convenience of being in town. It is a mere 5 min walk to the legendary Joe’s Beerhouse. 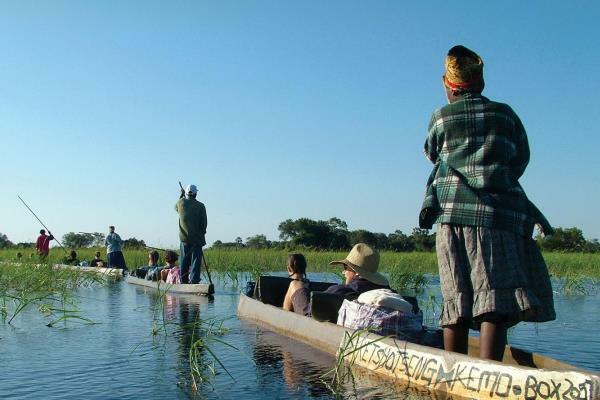 Enjoy game walks, a traditional mokoro (dugout canoe) and birding on an overnight excursion into the Okavango Delta. After a couple hours in the mokoro, we arrive to our basic bush camp in time for lunch. Set up tents and get used to the surroundings. In the afternoon, set off on a game walk. In the evening, count the shooting stars, sing with the locals or just unwind with a sundowner around the campfire. Enjoy the sunrise on an early game walk then return to Maun, first by mokoro, then safari vehicle, and arrive around lunch time. Pack up the truck, then hit the road to ancient baobab trees of Gweta. We will arrive to our campsite mid- to late afternoon. Have a walk around, take pictures of the baobabs, swim in the pool and enjoy a proper shower after the night in the bush. Opt to embark on a wildlife-viewing boat cruise on the Chobe River or take an open safari vehicle game drive inside Chobe National Park. Journey to the area of Chobe National Park, home to the largest elephant population in Southern Africa. The best way to appreciate the area’s thousands of resident elephants, crocodiles and hippos, is with an optional sunset boat cruise on the Chobe River. You may instead opt to embark on a game drive in search of lions, antelope, and of course, elephants. Cross the Zambezi River by ferry into Livingstone, Zambia. Cross the border from Botswana to Zambia at the Kazungula border post. Cross the Zambezi River by ferry to enter into Zambia and continue on to Livingstone. Livingstone is a great base to see both natural wonders and take part in some exciting activities. Livingstone is a great base to see both natural wonders and take part in some exciting activities. Get up close (and wet from the spray) while awing at the immense Victoria Falls, raft the whitewater of the mighty Zambezi, and for the more adventurous, bungee jump with the Victoria Falls in view. Depart after breakfast for your flight home. As there is a long wait in Johannesburg enjoy a double room at the transit hotel in Johannesburg Airport before your onward flights. Arrive home early the following afternoon.